Gold prices on Monday fell by Rs 180 to Rs 27,520 per ten grams in the national capital, giving a boost to brisk retail purchase on Askshaya Tritiya and jewellers expect a 40 per cent rise in sales on this day. Major players like P C Jewellers and Gitanjali Group are expecting total sales to increase by about 40 per cent on Askshaya Tritiya day, considered to be an auspicious day for buying gold and silver. 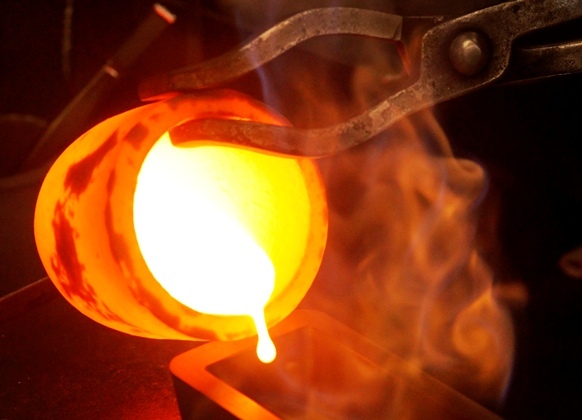 Image: Liquid gold is poured into a mould. "Initial report is very very positive. Footfalls were higher than last year's. "This is because of the price fall we have seen in the last couple of weeks and also because of the Akshaya Tritiya festival," World Gold Council India Managing Director Somasundaram PR told PTI. 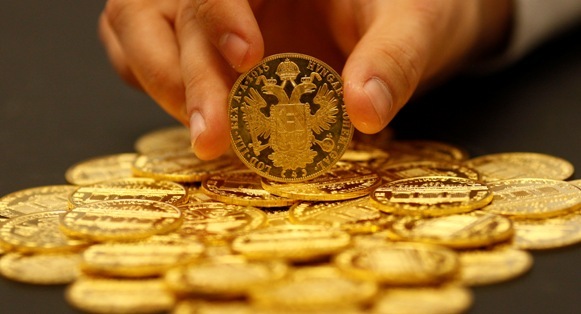 Gold prices fell by Rs 180 to Rs 27,520 per 10 grams on Monday, while silver prices also dropped by Rs 300 to Rs 45,500 per kg taking weak global price trend. Image: An employee sorts cold coins in the Austrian auction house Dorotheum in Vienna. Gold prices have fallen by 5.4 per cent since the last year's Akshaya Tritiya day on April 24, when gold rate was Rs 29,100 per 10 grams. Traders and market experts said there were higher footfalls in most of the jewellery shops and MMTC counters. Some retail consumers were involved in token buying, while others were taking orders for marriage demand. 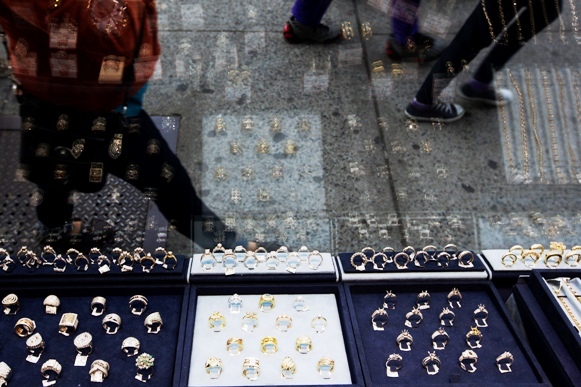 Image: Pedestrians walk past gold and silver jewellery displayed in the window of the Gold Standard jewellery store specializing in purchasing raw gold and silver in New York. "Retail consumers are buying especially today keeping the significance of the festival. 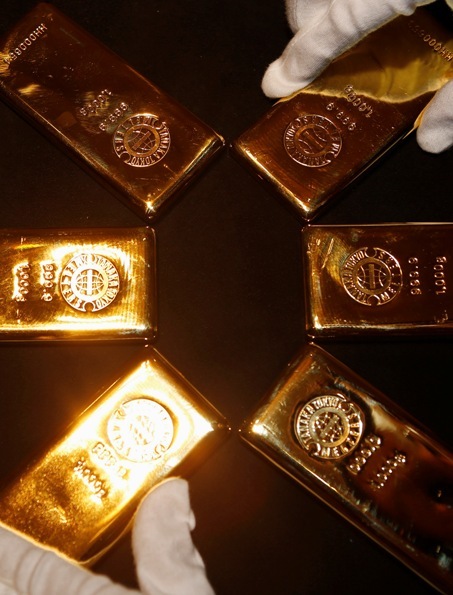 Much of the gold buying took place in the last 15 days when prices fell significantly," Bullion and Jewellery Association President Ram Avatar Verma told PTI. Chandini Chowk, the hub of bullion trade, witnessed a mad rush for buying gold on the occasion. Most of them were purchasing gold jewellery, he said. 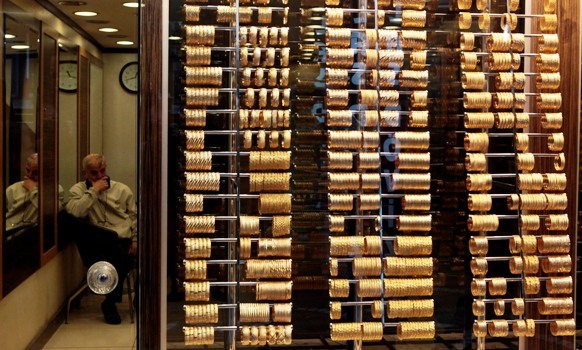 Image: Gold bars are displayed at the Ginza Tanaka store in Tokyo. On expected gold sales on the auspicious day, P C Jewellers Managing Director Balram Garg said: "We are hoping 40 per cent jump in sales today as compared with last year." City-based P P Jewellers Vice Chairman Pawan Gupta said, "Because of lower prices, we expect sales today to double from the last year's Akshaya Tritiya day." Image: A goldsmith waits for customers at a jewellery shop at the Grand Bazaar in Istanbul. occasion of "Akshya Tritiya" and retail investors shifting their funds from melting equities to bullion. to $1,431.68 an ounce and silver by 1.3 per cent to $23.57 an ounce. 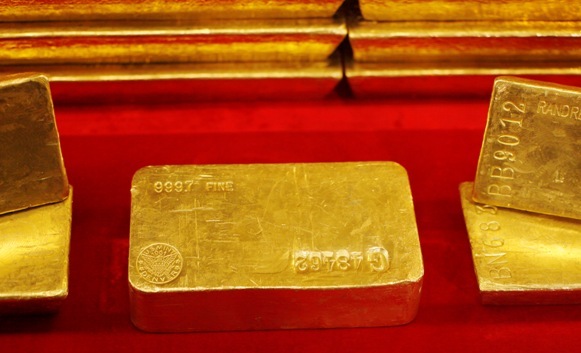 Image: Gold bars are seen at the Czech National Bank in Prague. Rs 23,900 per piece of eight gram on festival demand. coins held steady at Rs 75,000 for buying and Rs 76,000 for selling of 100 pieces in scattered deals. 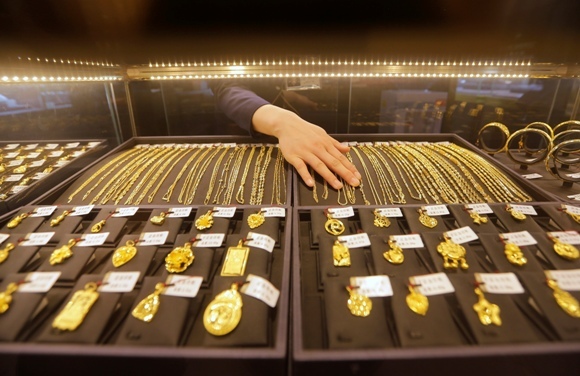 Image: An employee arranges gold jewellery in the counter of a gold shop in Wuhan, Hubei province.